A crocheted baby dress may be the perfect outfit for bringing a baby girl home from the hospital or for her first photo shoot. No matter whether it's a dress for your own baby or you are gifting a mother-to-be at a baby shower, this beautiful dress is sure to become a treasured keepsake. The pattern size for this crocheted dress is 0-3 months. A crocheter with basic to intermediate skills will be able to complete this project with ease. Click on the pattern thumbnail to download and print the dress instructions. Refer to this guide if you need dditional copying the PDF pattern. While it is wonderful to find a pattern that perfectly fits your needs, sometimes small changes are desired. The following suggestions will help you tweak this pattern to give it your personalized touch. 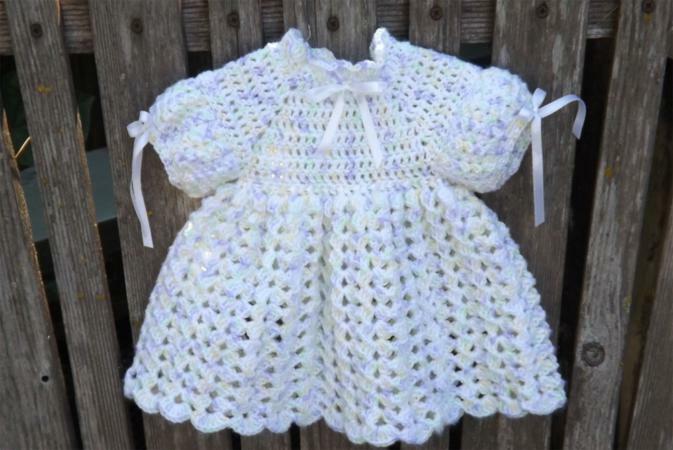 Turn this pattern into a christening gown by using white yarn. Before adding the last round to the skirt, crochet 15 more rounds of Rnd 11. Finish the last round (Rnd 38) as written for Rnd 23. While this pattern does not include different sizes, there are a few tricks you might try for enlarging the design. This sizing chart for babies will give you correct measurements for the size you are looking to achieve. Larger hooks and/or heavier weight yarn will help with increasing the size, but increasing stitches in the chest, neck and arm openings, as well as additional rows to the length may be needed. Keep in mind you will want each finished measurement to be approximately 1 1/2-inches larger than the baby measurements for ease of movement. After you finish this dress you will be itching for more crocheted sweetness. 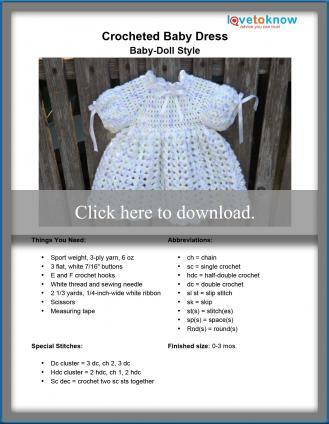 Check out these free crochet patterns for baby dresses. Each dress is done in a different style with well written instructions. Crochet Jewel delivers a gorgeous 0-3 month ruffle dress using worsted weight yarn. The dress starts from the waist up for the bodice, and then the waist down for the skirt. Simple stitches and clear instructions make this a great project for a crochet beginner. This Housewife Life had cabin fever when she whipped up this adorable baby dress. Sized at 3 months, this pattern uses worsted weight yarn. The instructions are a little more challenging, but nothing that an intermediate stitcher with a firm grasp of basic crochet stitches couldn't handle. Perfect for a spring baby, Crochetvolution has a sweet sundress made using cotton yarn. Suitable for a beginner, this easy pattern includes 0-3 month instructions with changes for 3-6 months. The months leading up to a baby's birth can seem to drag on forever. Crocheting baby clothes is a great way to while away the time while you create a much needed wardrobe and layette for baby. You can never have too many clothes, blankets, bibs and booties.